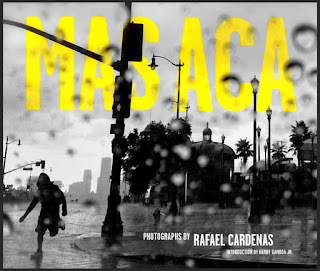 MAS ACA, the self-published, hard-cover edition of photographs by East LA-raised and Boyle Heights-based Rafael Cárdenas, will be released with an official book-signing and exhibition on July 8, 2016 at Espacio 1839, a long-standing gallery, bookstore and artisan boutique located at 1839 E. First St. The powerful and highly anticipated collection, made possible in large part through crowd-funding support, is the artist’s first-ever foray into the realm of high-gloss, coffee table quality publication and represents a survey of his photographic work from 2010 to 2015. The book release and accompanying exhibition of photographs will be preceded by an informal plática from 5p.m. to 7p.m. at Primera Taza, the eclectic, home-grown Boyle Heights café located across the street from Espacio 1839 and now co-owned by Chuy Tovar and Angel Orozco. During the coffee house discussion, Cárdenas will share the story of how the book came together and describe his non-traditional trajectory as an artist and photojournalist. One of five artists selected to participate in the 2016 LA Metro Lightbox Project, he will also entertain questions about his Anonymous series of lightboxes currently installed at the Hollywood-Highland Metro Red Line station. With a forward written by ASCO Art co-founder, internationally acclaimed photographer and conceptual artist Harry Gamboa, Jr., MAS ACA also features poetry by beloved LA writer and “maestra de la metáfora” Gloria Enedina Alvarez and Fresno’s Joseph Ríos, an emerging poet and literary critic whose work has appeared in both Brooklyn & Boyle and HUIZACHE, the definitive literary magazine being described as “The Paris Review” of Latino letters in the United States. The immaculately assembled and bound collection is comprised of over 100 riveting black and white images that capture many of the all-too often dismissed or invisible communities alongside increasingly endangered architectural and cultural landmarks found on the streets of contemporary Los Angeles. Cárdenas’ intimate view of his surroundings reflects a Los Angeles imbued with an unparalleled veracity. Accompanied by text from widely published author and Cal State LA professor Gamboa and poetic interpolations inspired by the photos themselves from Alvarez and Ríos, MAS ACA redefines East Los Angeles with both allegorical and literal truths that counter the banal and cumbersome stereotypes imposed by traditionally myopic mainstream media. For Cárdenas, the East L.A. seen in film and on television and in the news is a hastily constructed backdrop painted by lazy, entitled and smug caricature artists who assume it is their right to impose themselves as the arbiters of what is valid and true and, hence, valuable. MAS ACA is evidence that they are bereft of any real vision or ability to honestly describe East LA’s historic neighborhoods and communities. “Rafael Cárdenas takes on the role as a 21st Century documentarian and as interpreter of visual events that… sustain a mythical Los Angeles that owes its tempo, its peoples… to the wavelengths of light that have been captured through the lens of his perceptive vision,” Gamboa, says in his introduction, “Reflections in an Urban Eye,” accurately describing Cárdenas as a gifted truth-teller whose irises act as apertures that record the truest version of the places where they are focused. Following the book-signing and exhibit opening at Espacio 1839, the self-taught Cárdenas says, a celebratory after-party will be held at East Side Luv from 10pm – 2am. He is also pleased to announce that a two-person show of his work and that of renowned artist Sonia Romero, will open at Ave. 50 Studio on September 10th of this year.